Last week, I began discussing the differences between raster and vector graphics in digital images. This week is part two of the discussion and focuses on vector graphics – what they are, and how they can benefit you and your business. Whereas raster graphics, discussed last week, are made up of a grid of pixel information, vector images are not. Rather, vector images are mathematically created images made up of lines, curves, anchor points and shapes. Vector graphics can be used for simple or complex logos, diagrams and more. If you look at the detail of most major label brands’ logos (i.e. Lay’s, Facebook, GE), there is not an exceptional amount of detail in the logo image itself. In a vector logo, there is typically some simple, smooth shapes and lines with an interesting typeface on the package. For example, examine Coca-Cola’s logo. 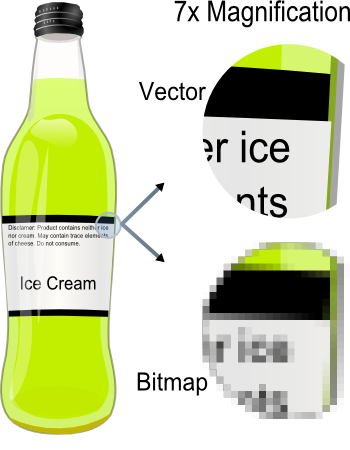 It is not a highly detailed image of someone drinking the product in an interesting, colorful setting, requiring a raster graphic. It is simply a typeface, made from lines and curves with a simple two-color design. So, as with most logos and branding, it is not about the detail as much as using a simple vector graphic in a clean and professional manner. And if you understand that these vector graphics are mathematically created from lines and curves, then we can focus on the major advantage of a vector graphic: scalability. You can enlarge a vector graphic the size of your thumbnail into the size of a billboard without having to re-create the image. Because it does not use a grid of dots like a raster, the enlarge process is no problem for vector graphics. This keeps your vector images always looking clean and smooth. In terms of which software should be used to begin working on any type of graphic, industry-leading Adobe Photoshop is designed initially for raster image editing and creation. By contrast, Adobe Illustrator is intended to work for vector graphics. However, there is definitely some cross-over between the two programs. 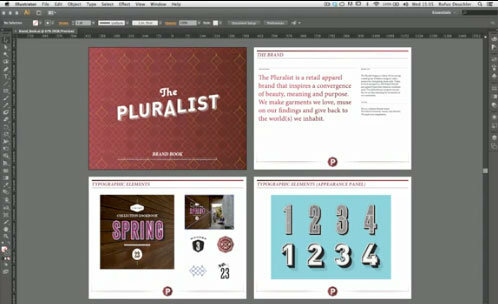 Most professional graphic designers need both programs in their tool belt. Photoshop can be used for complex raster projects, maybe involving lots of jpg or gif files. On the other hand, Illustrator would be used for more business-related documents such as logos, brochures and simple marketing materials. Both programs are powerful applications that can help you bring your digital graphic ideas to life like never before. I highly recommend diving into both and finding out how creative and fun it can be for yourself. Stu Crair is the owner and lead trainer at The Digital Workshop Center, providing digital arts and computer training instruction in Fort Collins. Call him at (970) 980-8091 or send email to stu@ fcdigitalworkshop.com.